Warwickshire will be playing their final away fixture of the season in the Premier Division of the BDO Inter County Championships this coming weekend when they line up against Devon at the Heavitree Social Club, Exeter. The hosts look doomed to relegation to division one as they are currently bottom of the table on 106 points, a massive 27 points short of safety. A win for Warwickshire is fully expected from the game which could see them move up the table to a higher position than what they currently hold which is seventh. Selected to play for Warwickshire are Men’s ‘A’:- Steve Hine, Kevin Dowling, Nigel Heydon, Mark Westgarth, Noel Grant, Antony Allen, Tom Aldridge, Tom Ryan, Dean Stewart, Carl Green, Simon Power, Charlie Symons, Men’s ‘B’:- Luke Kennedy, James Hykin, Ian Shaw, Karl Reynolds, Ashley Hykin, Rob Comben, Mark Carter, Anthony West, Richard Foster, Adam Paxton, Tom McGlone, Jack Wareing, Reserves:- David Hill, Gareth Braham, Mark Strong, Jamie Hughes, Prakash Jiwa, Matt Edgar, Ted Evetts, Women’s ‘A’:- Caroline Pike, Sue Gulliver, Wendy Adams, Nina Bolt, Marian Conway, Kat Spanswick, Women’s ‘B’:-Donna Pinch, Helen Rigg, Angela Jones, Melanie Jones, Chloe McKivett, Denise Keyte, Reserves:- Ann Rodgers, Lisa Deslandes, Tracey Edgecombe, Lucy Keyte. Lining up for the West Midlands will be Men’s ‘A’:- Mark Craddock, Keith Allman, Gavin Baker, Michael Baker, Scott Baker, Shaun Carroll, Alfie Jacques, Ian Jones, Ash Khayatt, Glen McGrandle, Dean Mills, Danny Nicholls, Men’s ‘B’:- Matthew Dicken, Adam Edgar, Martin Greenwood, Sam Guest, Jonathan Platt, Richard Platt, Neil Pointon, Shane Price, Avtar Singh, Jordan Singh, Robert Smith, Paul Wells, Reserves:- Danny Coyle, John Mycock, Paul Price, Gary Watts, Women’s ‘A’:- Kim Fellows (Capt), Gemma Barrett, Sarah Roberts, Lisa Badger, Debbie Loon, Kath Jenkins, Women’s ‘B’:- Elizabeth Arnold, Shellbie Simmons, Heather Wright, Grace Angell, Jacqueline Maiden, Shannon Hall, Reserves:- Sophie Singh, Kelly Dolman, Claire Hobbs. 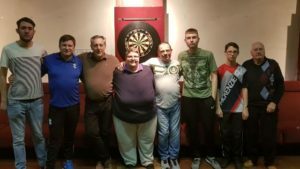 The South Birmingham Winter League had the quarter finals of their Roy Parry Consolation Cup on their agenda and winning through to the last four were Chelmsley Conservative Club, Coleshill Social, Crown Jewels and Toby Jug. Chelmsley, Crown Jewels and Toby Jug all had 5-4 wins in turn against C’s Flights, C’s Arrows and Kingfisher, Coleshill Social the biggest winners as they beat The Gate 6-3. It was cup final week for the Forest of Arden Winter League as they played off the finals of their Rose Bowl and Rose Bowl Consolation Knockouts. In the Rose Bowl final there was sweet revenge for league runners up Journeys End as they defeated their local rivals and league champions Journeys End Flights 5-4 with a D.Wilson hitting a maximum for the winners, John Sidwell and Bob Nixon both hit a 180 for Flights. The Rose Bowl Consolation final was again a close 5-4 result with Kingshurst Knights getting the verdict over Highwood Arms. East Birmingham Allotment Holders Association did their Small Heath League title hopes no harm whatsoever when in their fixture with bottom of the table Emerald Club they handed out a 9-0 whitewash to keep them six points ahead of second in the table Heartlands Club who 6-3 away to Sheldon Marlborough Arrows. Third placed Sheldon Marlborough Flights had a bye and are now ten points adrift of Heartlands with a game in hand. Journeys End Lions made it a league and cup double when they won the Camp Hill League’s League Cup beating Cotterills Lane Club 5-2 in the final. The Consolation Cup title went to Tyseley WMC, Station Wagon finished as runners up after narrowly losing the final 4-3. The Warwickshire youth squad played their final home game of the season against Shropshire, the visiting team only able to muster eight players with some of them having to play twice. Nevertheless that shouldn’t detract from the final 9-6 win for Warwickshire who now with two more games to play are assured of the title. The Under 18’s won 5-2 thanks to wins from George Ross, Jake Liggins, Jordan Ainsworth, Joe Pitchford-Morris and Mackenzie Nixon. Wins from Laura Bowley, Courtney Hine and Lucy Keyte gave the ladies a straight 3-0 victory but the Under 21’s suffered a 4-1 defeat as Tom Mills supplied their one and only win. Twelve points is the difference between the top two players in the Erdington Red Lion Double Top League, leader Will Naylor adding another two wins to his tally to give him 116 points. He won 3-0 against Ryan Barritt and then registered a vital 2-1 win over Jim Frost who as a result of his defeat drops from fourth to fifth place. Second in the table Dean Bayliss reduced the arrears slightly on Naylor with 3-0 wins over both Stuart Larvin and Richard O’Grady. Young Richard O’Grady made it two wins in 46 games when he added a notable 2-1 win over Lewis Bayliss to his account, Bayliss being placed fourth in the table and a massive 76 points ahead of O’Grady, the win quite an achievement by O’Grady.. The Sutton and District Summer League have got their new season underway comprising two divisions of nine teams. The division one lead is shared by Golden Hind and Erdington Club who are level on points and average. 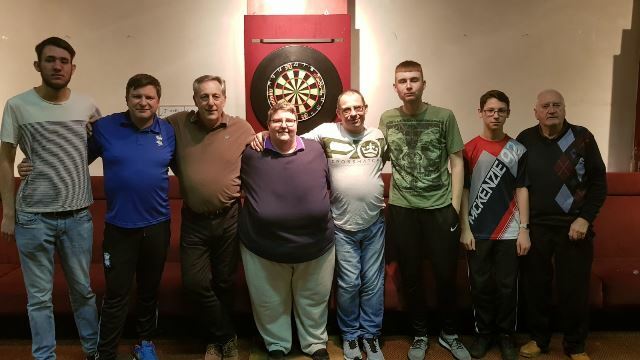 Hind won their first two games against Drakes Drum and Bishop Vesey 6-3 while Erdington beat Oscott Social 7-2 in their opener and then had a close 5-4 against local rivals Erdington Arrows. Third in the table The Boat are also on the same 12 points as the leading duo after beating The Fox 5-4 and Drakes Drum 6-3. In the second division Pint Pot Flights have an average lead over Rosey Mac’s after winning 9-0 against Lad in the Lane and following that with a 7-2 success against Boldmere Tap, Rosey Mac’s won both of their first two games 6-3 beating Sutton Sports and Social and Lad in the Lane. Old Oscott WMC are the only other team besides the top two with a 100% win record in the division but they have only played one game so far. The Stourbridge and District Monday Night League have kicked off their new season with 22 teams, The Swan are the early pacesetters after handing out a 9-0 whitewash to their hosts Hare and Hounds ‘A’ with Hop House and last season’s runners up Ten Arches ‘A’ hot on their heels with 8-1 wins over respective opponents Garibaldi and Crestwood. It was not a good start to the new campaign for reigning champions Ten Arches ‘B’ as they went down 5-4 away to Brickmakers Arms. 7-2 wins for the top two teams in the Rowley Monday Night League as leaders George took their unbeaten run to eleven games with a win at Lodgers and second in the table Bell won their home tie against Cottage to keep within two points of George. There was a 5-4 defeat for third placed Ex Serviceman’s ‘A’ away to Cradley Liberal Club, the Liberal Club joining their opponents on 18 points in fourth place. Ivy Bush had a 5-4 home win over Roost to put them also on 18 points in fifth place. The Netherton Thursday Night League played the first leg of the semi-finals of their Andy Bastable Trophy in which league leaders Dudley Ex Serviceman’s Club surprisingly lost 6-3 away to next to bottom of the table Fairfield and Bulls Head who are second in the table won 5-4 away to Delph Bell. In the Shadow Cup semis Townsend Club won 7-2 against White Horse and Riddins Tavern had a 5-4 success at The Crown. Club Dudley were the only losers in the top five teams in the Sedgley and Gornal Tuesday Night League in week 23, losing their home tie with fourth placed Coseley Tavern 5-4. First and second placed Parkes Hall and Old Bulls Head had 7-2 wins in turn against Gornal British Legion and Jolly Crispin to keep Parkes Hall just two points ahead of their rivals. Third in the table Gornal Labour Club were the week’s biggest winners, an 8-1 victory at Red Cow to put them on the same 36 points as Ashwood and Coseley Tavern, Ashwood beating Five Ways 6-3. It was top versus bottom in match ten of the Silver End Sunday Morning League as leaders Netherton Cricket Club took on and beat Kings Head 6-2. Just one point behind the leaders is reigning champions Woodside who had a 5-3 win at Dudley Sports. Brickmakers Arms ‘A’ were involved in a local derby with their ‘B’ side, a game that finished all square at four each but seeing both teams drop down one place in the table, the ‘A’ side being replaced in third place by Pensnett Welfare Club after their 5-3 win over Dudley Ex Serviceman’s Club and the ‘B’ team dropping down to fifth in the table. A 6-3 win at Portway maintains Dudley Ex Serviceman’s Club two points lead in the Brierley Hill Monday Night League over Bulls Head (Netherton) who won their tie away to Mount Pleasant 5-4, Mount Pleasant dropping one place to fourth in the table and being replaced in third place by Dudley Sports ‘A’ who won their home game with The Swan 6-3. The Vine, who are sixth in the Hilltop Friendly Tuesday Night League handed out a 4-3 defeat to their visiting team Island Inn, who as a result lose their second place in the table to Wagon and Horses who beat Sportsman 5-2. Leaders Tipton Sports won 6-1 at new Talbot to put them two points to the good on Wagon and Horses. Wheatsheaf have dropped two places to fourth in the Cradley Tuesday Night League after losing their home fixture with Netherton Cricket Club ‘A’ 6-3, the Cricket Club moving up one place to second behind Brickmakers Arms who suffered their first loss in seven games when they went down 5-4 at Hawne Lane Tavern. A 6-3 win for Bulls Head at Gate Hangs Well has seen them move up into third place on the same 12 points as the top two teams. Paul Higgins completed his fixtures in the Shirley Premier League with 3-1 wins over both Andy Hoy and Antony Daly to put him top of the table on 71 points, the following duo of Tom Bent and Dave Heighway have also played all of their games, Bent finishing with 70 points after winning 4-0 against Jack Nason and then being held to a 2-2 draw by Mark Gwalchmai while Heighway is a further three points behind rounding off his fixtures having a 2-2 with Trevor Carter and then winning 3-1 against Andy Hoy. Fourth in the table Phil Thomas is on 65 points with two games still to play and mathematically he can amass 73 points and take the title while seventh placed Mark Gwalchmai also has two to play and with maximum points he could finish in the top three. A reminder the Brierley Hill Friday Night League will be holding their AGM to form the 2018-2019 season on Sunday 20th May at Dudley Sports beginning at 11.00am, all teams both old and new are cordially invited to attend. Highwood are outright leaders of the Shirley and District Monday Night League once again, but by the narrowest of margins. Prior to the latest fixtures Highwood were level on points and average with Dunky’s Boys, but with Dunky’s winning 5-4 against third placed Red Lion and Highwood having a 6-3 win over Drawbridge Bears they are one leg of average to the good on Dunky’s, both teams having 44 points. The two top teams in the Pip Club League met in the final of the Division One Divisional Cup after in the semis The Office beat Dolphin Wanderers and Queens Head defeated Belgrave Club. The final produced a win for Queen Head. In the Division two semi-finals there were wins for Red Lion and Pip Club at the expense of Old Liberal House and Wigginton Arms. The final went in favour of Pip Club. 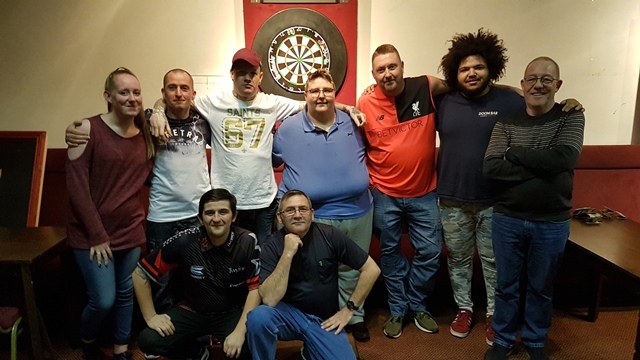 It’s tight at the top of division two of the doubles section of the Wolverhampton Tuesday Night League with three teams all on eight points. Village Inn are top by just two legs of average on both County and Penn Bowling. Victoria with an unbeaten ten points top the division one doubles section, Wednesfield Conservative Club second on eight points from four games. In the singles sections Riley’s ‘C’ have won all five of their games in division one and have a lead of four points over Victoria and Sunbeam while topping division two is Wednesfield Legion with ten points from their five games, Dog and Partridge ‘B’ second with eight points. Unbelievably after ten games three players, Simon Mountford, Duane Hart and Matt Moore share the top spot in League One of the Yeltz Bar Tuesday Night Singles League, all three of them have 40 points and exactly the same average. In League Two Rob Smith tops the table with 40 points from ten games while one time leader James Hykin is second with 35 points from nine games. Two players have the same 42 points and average at the top of League Three, Loz Slater heading the table by virtue of the fact he has won ten games and second placed Richard Hill has won nine.